The Kerrie Show: "Get Organized, Stay Organized" Review and #Giveaway!!! 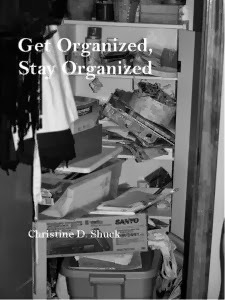 "Get Organized, Stay Organized" Review and #Giveaway!!! that person who is always griping about their messy house (like me, except I already own this book) as a friendly gift. to that hoarder down the road. G'head, just slip it in their mailbox! I dare you. as a wedding gift for a new bride who is clueless about combining two households of junk. Okay, just looking at the cover of this book makes me itchy. Not that I am a neat freak by any means. But I do like to be able to FIND things, and you don't have to have 5 kids like me to get very disorganized VERY fast. You can check this label here to see some of my Tackle-it Tuesday projects I've had going on. So if the cover makes me itchy, the table of contents makes me feel warm and fuzzy. Here's the Amazon listing so you can buy it on Kindle if you prefer, but at least you have take a peek inside at the full table of contents this way! Here's the Rafflecopter below so you can enter, but if you are dying to have this book for yourself or to sneak to someone else, you can order by writing the author herself at shuckchristine at gmail dot com (gotta watch out for those spammers, you know), and she is happy to give you a nice discount on the book! Instead of the original $15 + shipping price, she's going to send it to you for only $11 including shipping. It's a 158-page book that will change your life!